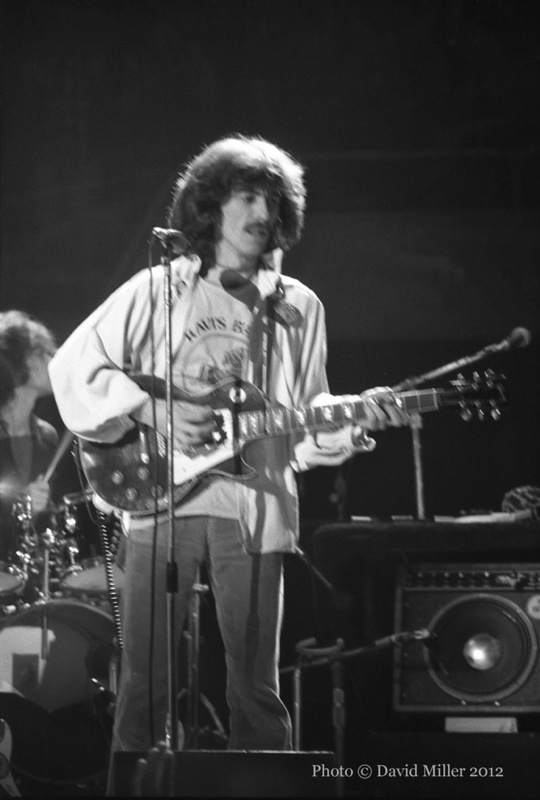 George Harrison was born in Liverpool, England, in 1943, and first displayed an interest in the guitar while he was in his early teens. As a member of The Quarrymen, he played skiffle and rock'n'roll alongside John Lennon and Paul McCartney at small venues in Liverpool during the 1950s. 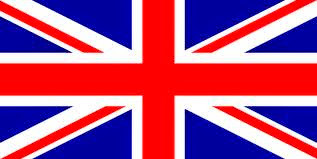 He later performed with Lennon and McCartney at clubs in Hamburg, Germany, as a member of The Beatles. After being signed to Parlophone Records, The Beatles (with Ringo Starr on drums) became extraordinarily famous around the world as a result of the many hits that they released during the 1960s, commencing with "Love Me Do" in 1962. By the end of that singular decade, George Harrison had gained high distinction as a guitarist, a vocalist, and a songwriter, with "Something" and "Here Comes the Sun," his two songs from Abbey Road (the last album on which The Beatles worked together as a foursome), achieving particular renown. 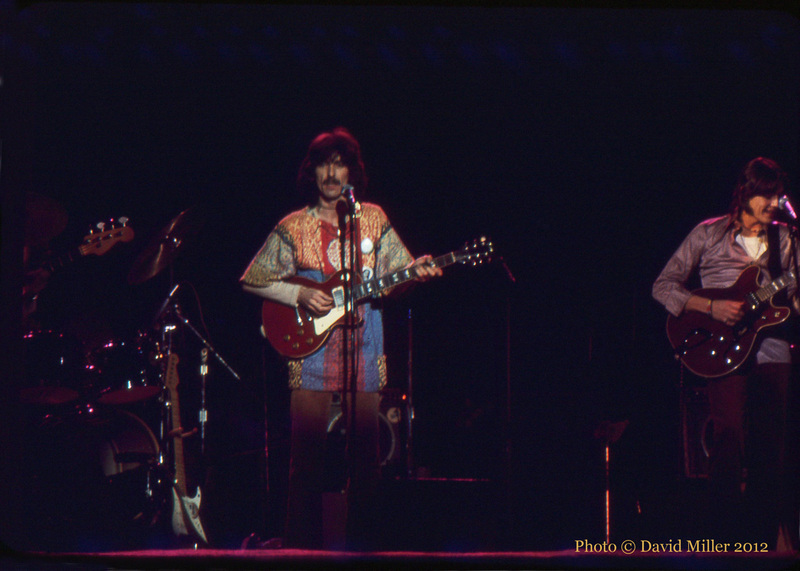 On the evening of November 8, 1974, eight years after The Beatles gave their final concert, at Candlestick Park in San Francisco, and four years after they had gone through an angry dissolution, George Harrison came to the Bay Area again, appearing in two concerts (at 6 PM and 10PM) at the Oakland Coliseum Arena, during his first and only tour of the USA. (He also appeared at the Cow Palace in Daly City, on November 6 and 7.) He was joined onstage by a collection of musicians that included two of his closest friends: Ravi Shankar, the Indian musician who taught him how to play the sitar in the 1960s, and Billy Preston, the American musician who played keyboards on "Get Back," "Don't Let Me Down," "Let It Be" and other recordings by The Beatles. 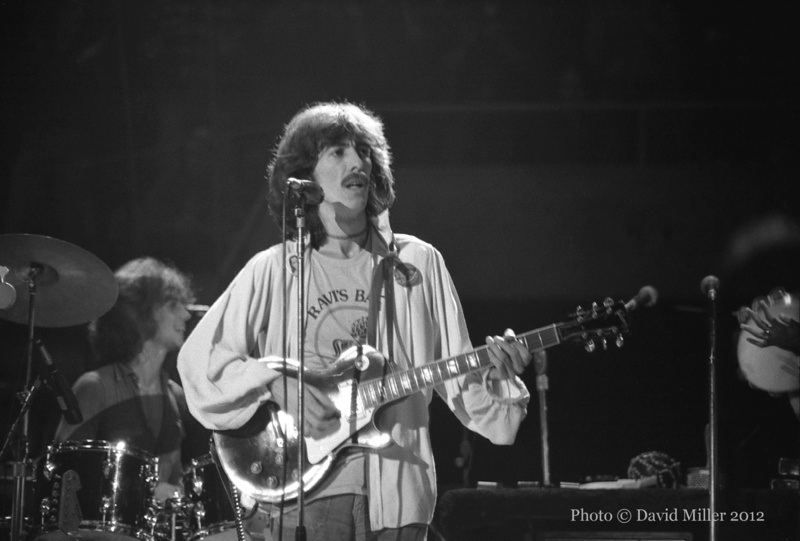 George Harrison, at that time in his life, was thoroughly determined to distance himself from his younger days as one of the Fab Four. In his comments to the press, he made it abundantly clear that he was not satisfied to be acknowledged merely as an ex-Beatle. 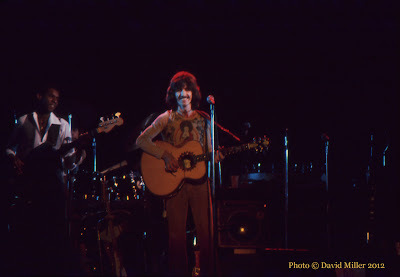 The overwhelming degree of public acceptance that had been accorded to his album, All Things Must Pass (released on Apple Records in November, 1970, and featuring twenty-three tracks spread over three LPs), had allowed him to step forward from the collective fame of The Beatles and firmly establish himself as a musical figure in his own right. 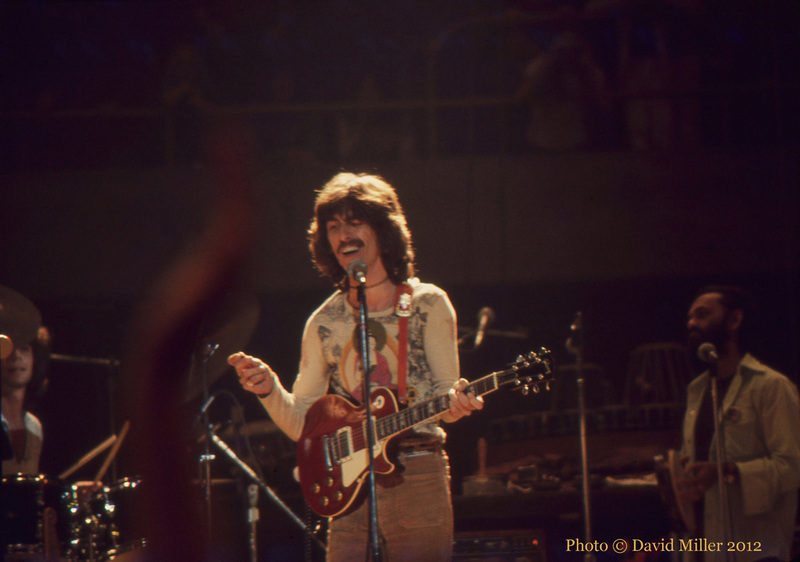 "My Sweet Lord," the first single taken from the album, also had been an enormous hit, quickly climbing to #1 in both the UK and the USA. 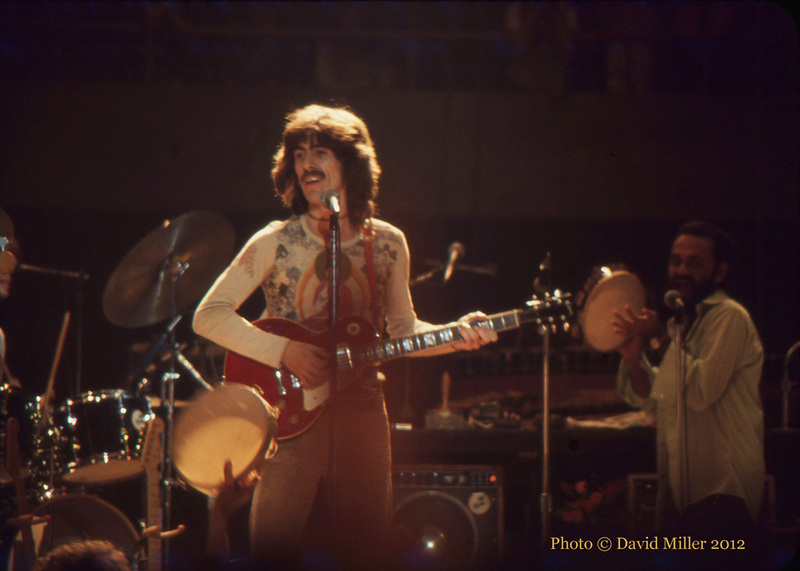 George Harrison had further enhanced his own stature a year later, in 1971, when he organized two charitable concerts at Madison Square Garden in New York City to benefit the people of Bangladesh, who were desperately suffering from the ill effects of both a civil war and widespread floods caused by excessive rainfall. 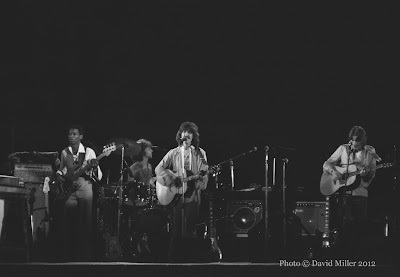 George performed at both concerts, which were held on the afternoon and evening of August 1, along with Ravi Shankar (whose request for help had inspired the concerts), Ali Akbar Khan, Ringo Starr, Bob Dylan, Eric Clapton, Klaus Voormann, Leon Russell, Billy Preston, and many others. 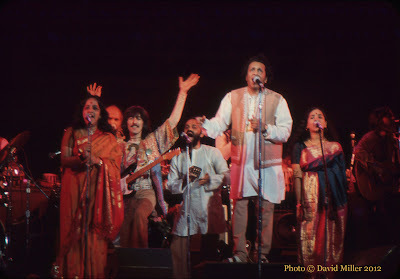 Performances from the two concerts were recorded and released under the name of The Concert for Bangladesh, as both an album (1971) and a film (1972). 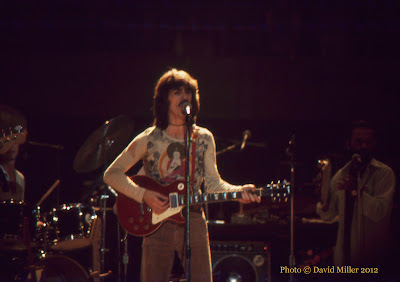 In 1973, George Harrison released Living in the Material World, his first album of new songs since All Things Must Pass. 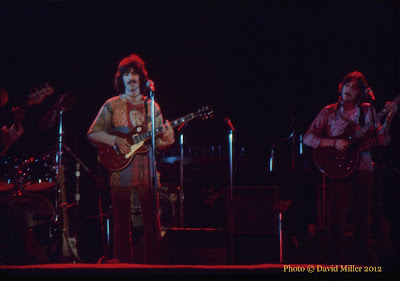 A single from the album, "Give Me Love (Give Me Peace on Earth)," went to #1 in the USA and #8 in the UK. 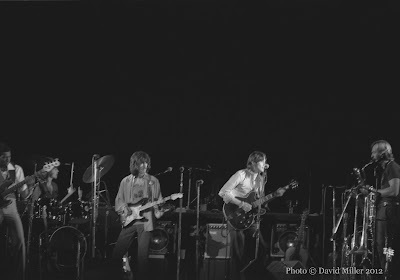 Many of the songs on the album, such as "The Light That Has Lighted the World," "Living in the Material World," "The Lord Loves the One (That Loves the Lord)," "Be Here Now," and "The Day the World Gets 'Round" were serious expressions of his spiritual beliefs ("I got born into the material world/Getting worn out in the material world"), reflecting his ongoing interest in Hindu philosophy and his deep concern for the unhappy state of mankind, but their earnest tone, while undeniably well-intentioned, did not meet with unreserved approval from all listeners. Although George Harrison was the member of The Beatles who had most disliked going on extensive tours during the cheerful madness of Beatlemania, after their painful breakup in 1970 he was, surprisingly, the first of the former Beatles to undertake a full tour of the USA. 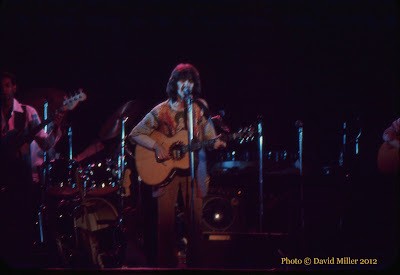 He was known to prefer the quiet and solitude of Friar Park, his home in Henley-on-Thames, but in 1974 he released a new album, Dark Horse, and took to the road. 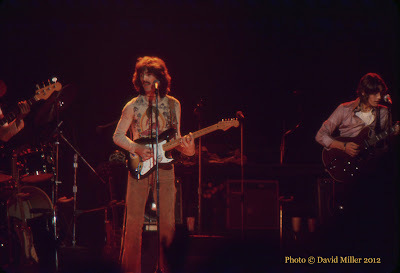 He also was going through a major change in his private life, separating from his first wife, Pattie (who later married Eric Clapton), and entering into a new relationship with Olivia Arias, who would become his second wife in 1978. 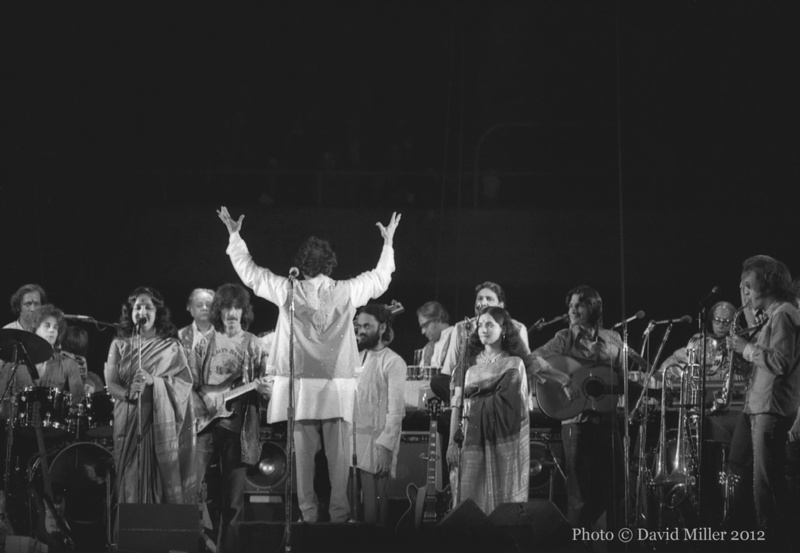 His decision to feature Indian music during his concerts was poorly received by some fans, but in spite of any misgivings, most people were extremely happy at having the opportunity to see one of The Beatles perform again. They were not the usual sort of concerts. 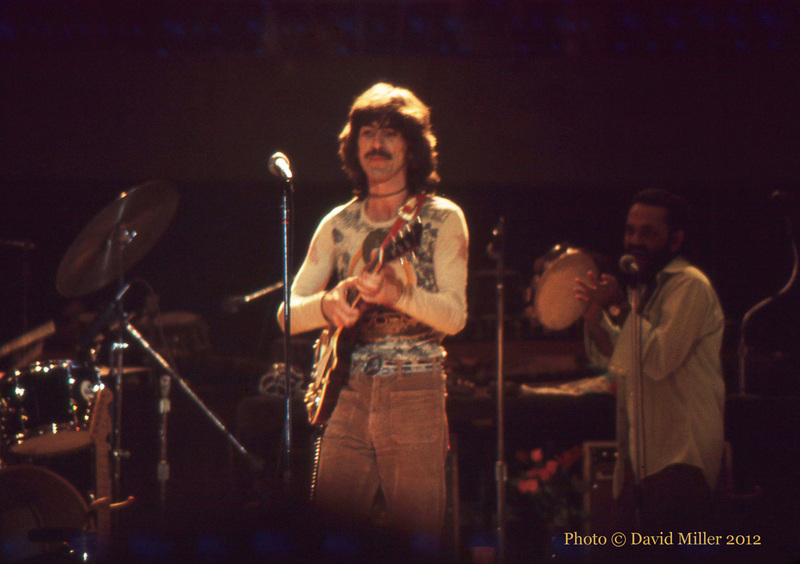 George Harrison took something of a gamble by choosing to combine the ancient sounds of India, to which he had dedicated himself years earlier, with the more unstudied sounds of rock'n'roll. 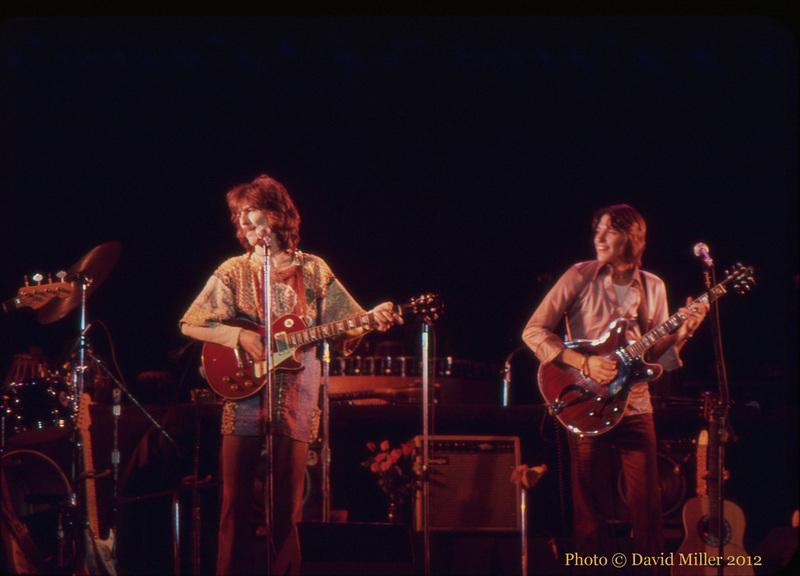 Many of those in attendance appeared to be primarily interested in hearing the celebrated songs that he had recorded with The Beatles and on his own. 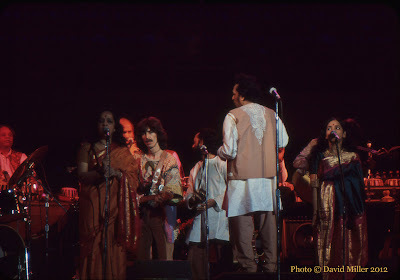 The offerings of Indian music, exquisitely performed by Ravi Shankar and an orchestra of Indian musicians after George Harrison and his band had opened the concert with several songs, were unfamiliar to most of the audience, and required a certain degree of patience on the part of a listener. In addition to the awkward mixture of musical styles, George Harrison's voice had been considerably strained during rehearsals for the tour, so he sounded unpleasantly hoarse when he was singing. He also seemed ill at ease with the necessity of being at the forefront as a performer. 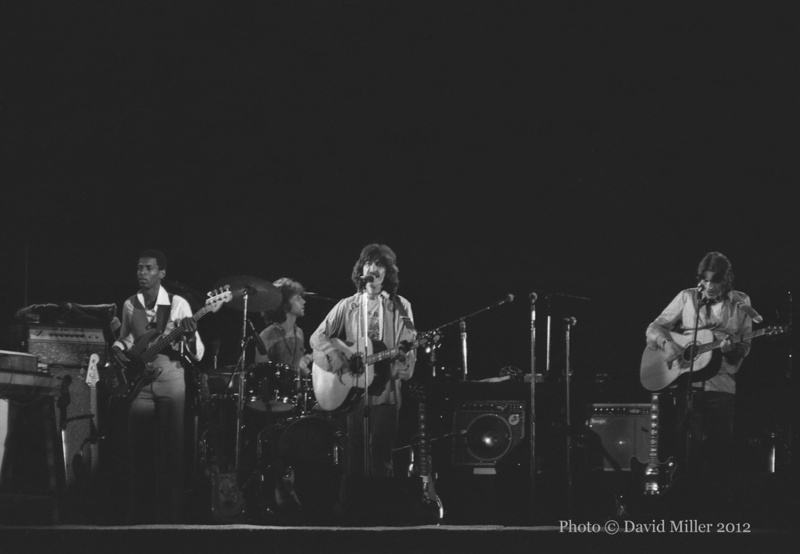 The music that George Harrison performed himself was greeted with an excited response by the audience. He started off with "Hari's on Tour (Express)," an instrumental from Dark Horse. 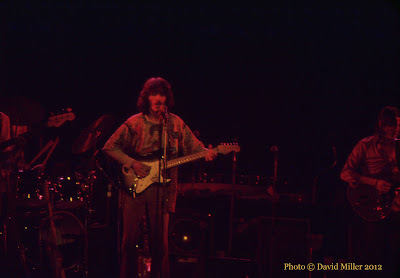 With smooth backing from an expert band that comprised Robben Ford on guitar, Willie Weeks on bass, Billy Preston on keyboards, Andy Newmark on drums, Emil Richards on percussion, Tom Scott and Jim Horn on saxophones, and Chuck Findley on trumpet, he played only four songs from his years as a Beatle ("Something," "While My Guitar Gently Weeps," "For You Blue," and John Lennon's "In My Life"), sometimes changing the well-known lyrics as he sang. 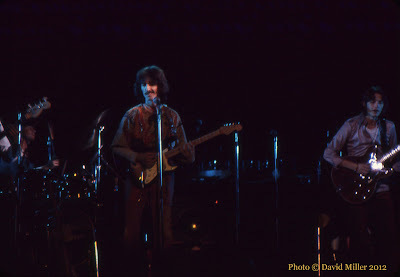 He also played "Sue Me, Sue You Blues" (a bitter song about the business difficulties that resulted from the breakup of The Beatles), "Give Me Love (Give Me Peace on Earth)," "Maya Love," and "Dark Horse," as well as two songs from All Things Must Pass: "What Is Life" and "My Sweet Lord." Billy Preston also was given time to perform a few of his own hits. 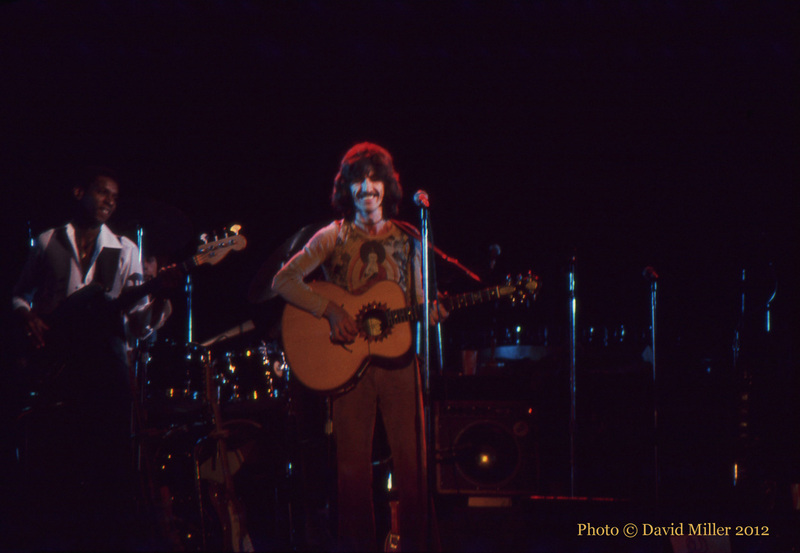 In 1974, George Harrison was adamantly unwilling to be the person that he sometimes peevishly referred to as "Beatle George," but it was understandably hard for his many fans not to think of him in that way. It seemed that whether George Harrison liked it or not, he still was (and probably always would be) a Beatle in the eyes of the public. He may not have been entirely comfortable with his formidable history, frequently regarding it as burdensome, but it followed him everywhere, diffusing itself throughout his life and his music, and was much too valuable to be fully denied or completely avoided. 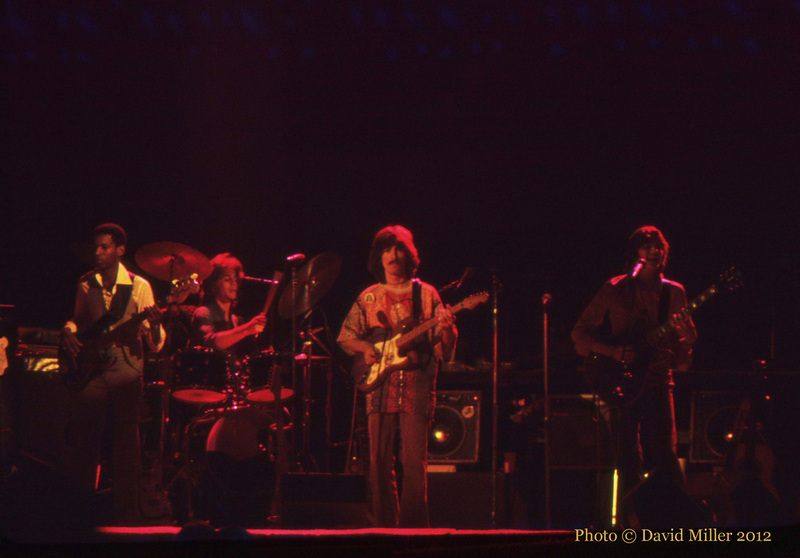 The two concerts at the Oakland Coliseum Arena did not signify an actual return to the headlong glory of Beatlemania, but for anyone who loved the songs and the spirit of George Harrison, either in The Beatles or out of The Beatles, they were a thrilling experience. 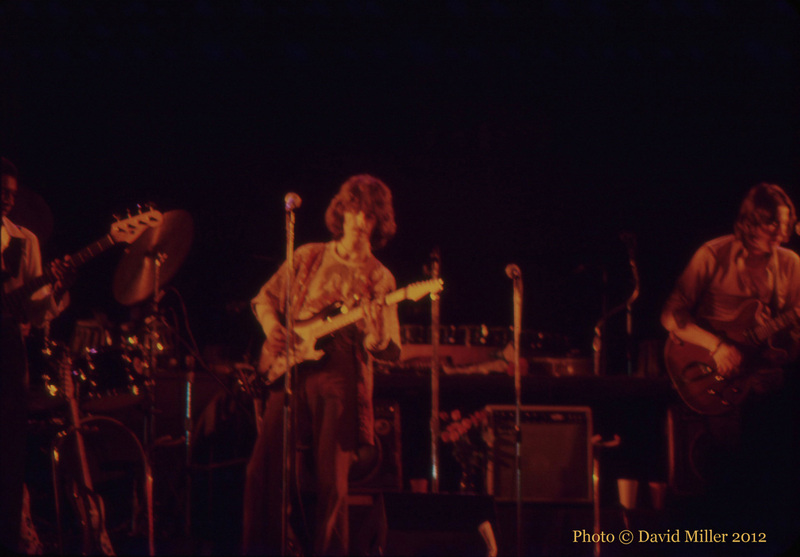 David: I deeply regretted missing The Beatles when they played their last concert at Candlestick Park in 1966. 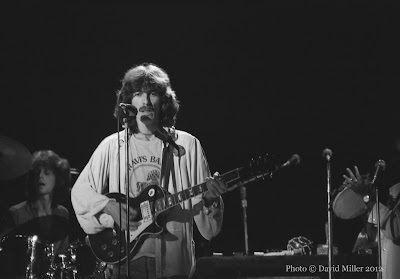 When I heard that George Harrison was going to play in our area, I couldn't believe it. I would finally have a chance to see one of the Fab Four in person. My friends and I found out that he was playing two shows at the Oakland Coliseum Arena and one show at the Cow Palace, south of San Francisco. We had to decide which show to attend. The Cow Palace was usually standing room only on the main floor. We had been there before and found it unpleasant. At Oakland we would get seats and be able to enjoy the concert in comfort. 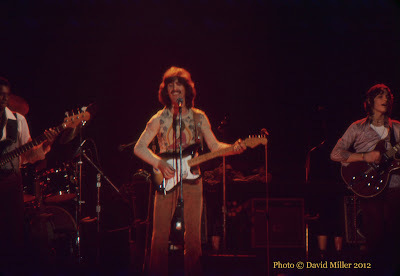 Then we had to decide between the two shows at Oakland. My friend, Michael, suggested that we attend both shows. 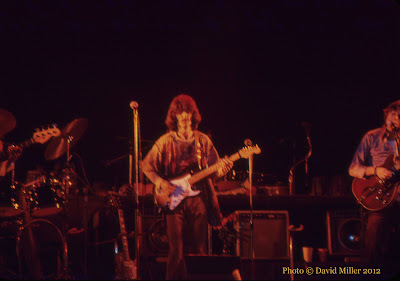 This was a once in a lifetime event, so we bought tickets for both shows at the Oakland Coliseum Arena. That seemed extreme back then, but looking back, I am surprised that Gary, Michael, and I did not go to the Cow Palace show, too. We knew that we wouldn't be very close to the stage, but I wanted to get good photos. I didn't own a telephoto lens, so I decided to rent one. It turned out to be a good decision. I bought one roll of color slides and one roll of B/W film. I shot color film during the first show and mostly B/W for the second. 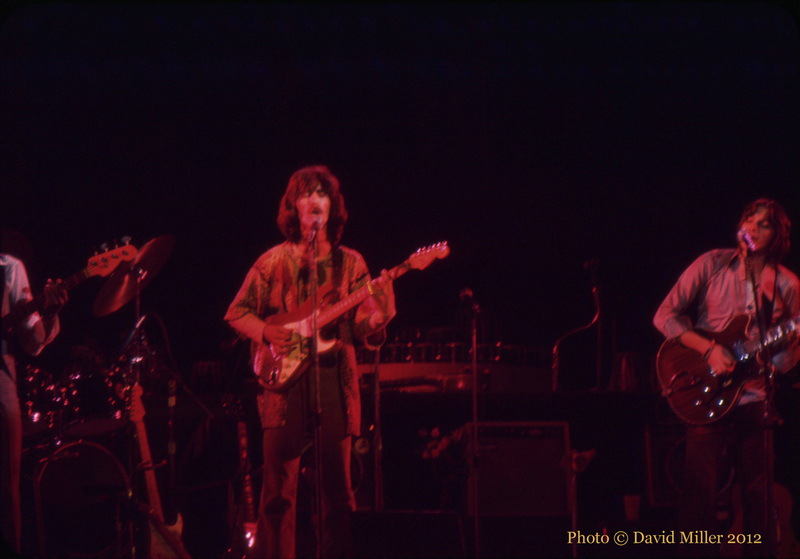 Each of the concerts began with a few songs from George Harrison and his backup band. Robben Ford was to his left, on guitar. 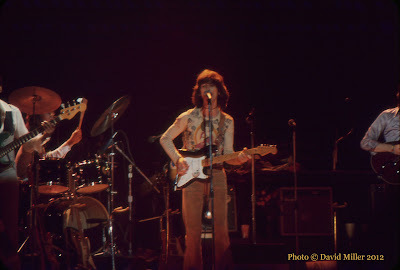 Willie Weeks was to his right, on bass. Billy Preston was to his far right, on keyboards. They started out with an instrumental song that was lively and featured an air raid siren. He followed that with his classic songs, "Something," and "While My Guitar Gently Weeps." It was like a dream to hear George play those songs. It seemed strange for him to start off with his biggest hits. I didn't know how he would top that. His voice sounded rough, like he had a cold or laryngitis. I also noticed that he changed some of the lyrics. "Weeps" became "smiles." It detracted a bit from a song that I had heard hundreds of times and loved. The next song was by Billy Preston. 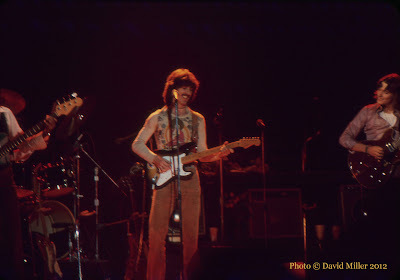 I liked Billy Preston, but I wasn't there to see him perform. 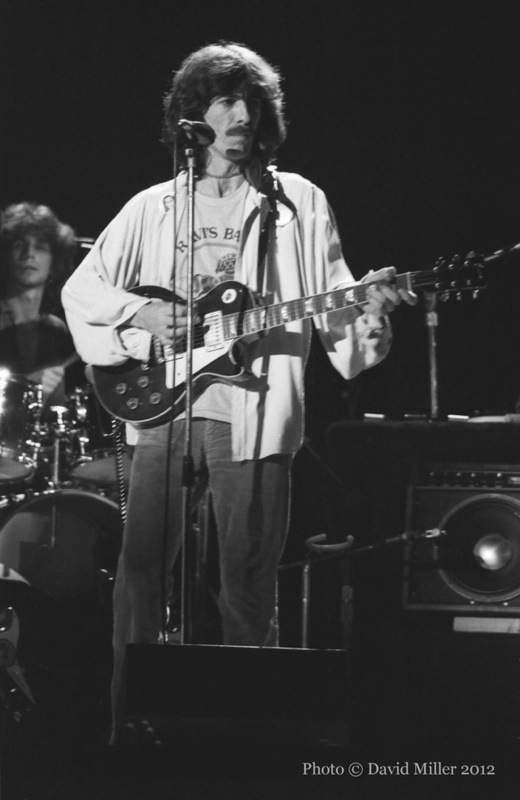 It seemed odd that he was sharing the spotlight with George Harrison instead of being the opening performer. 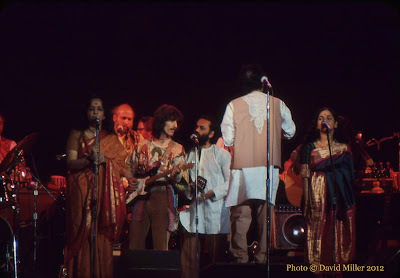 The concerts then continued with Ravi Shankar and fifteen Indian musicians. 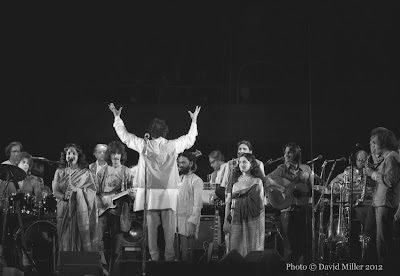 Ravi stood with his back and conducted the Indian orchestra. It reminded me of the old TV program with Mitch Miller, Sing Along with Mitch. 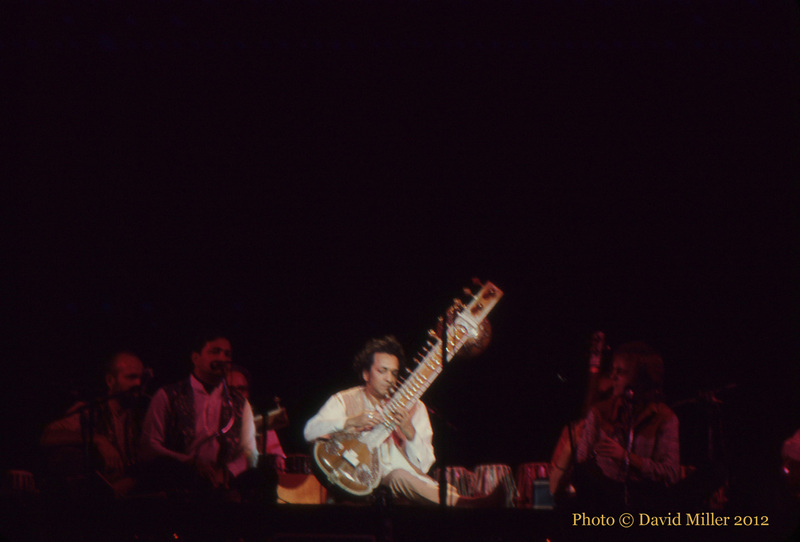 Ravi did play sitar a bit. I don't recall whether George Harrison was onstage with the Indian musicians the whole time, but he did join them for some numbers. After the set by the Indian musicians there was an intermission, and then George and his band returned to play again. 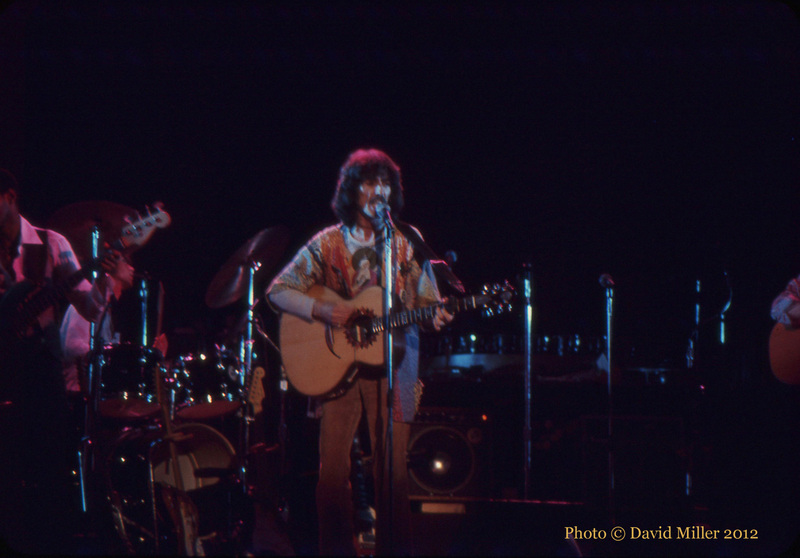 George did several songs, including "In My Life," a John Lennon song, and there were two more songs from Billy Preston. It was shaping up to be a mixed bag of great moments, odd moments, and some disappointments. The last few songs were George's. He played "What Is Life" to a cheering crowd. The last song was a rocking version of "My Sweet Lord." The audience got up from their seats and moved as close to the stage as possible. I decided that this was my chance to get some good photos. I pushed my way forward as far as I could get. I was jammed into the crowd and couldn't get any closer. Then I saw that most of the seats were empty now. Almost everyone was jumping up and down in the aisles. 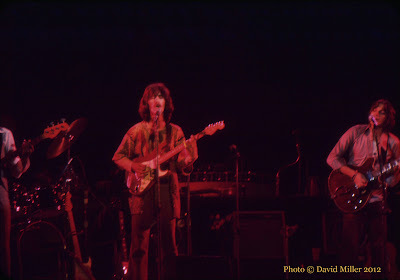 I climbed up onto the chairs right in front of George, just a few rows back. I clicked off the rest of my film. It was amazing to be staring right in his face at eye level with no one around me. I saw him look back at me, too. Before the song ended, George tossed his guitar on the stage, spun around and leaped over some equipment and flowers. He then bolted to the backstage area while the band played on. He ran like he feared the stage would be overrun by the fanatical crowd. I was absolutely stunned. It was like Beatlemania had never ended. 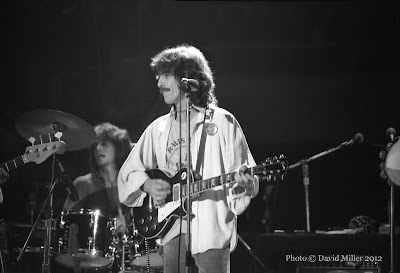 Gary: I was a Beatles fan from the early days, when I heard them on Air Force radio in France. 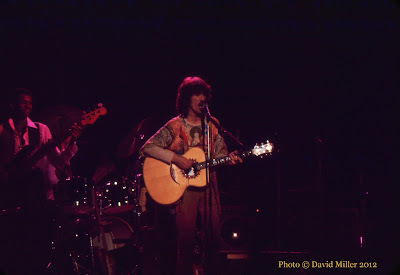 I remember having a long poster on my bedroom wall, that I think my Aunt Stella sent to me from New York, along with the only Beatles record (with Tony Sheridan) that she could find, which had a green cover and was claimed by my older sister. I loved the Beatle hits that were filling the airwaves and were heard on our clear-sounding Grundig console, or upstairs on my Phillips AM/FM radio, which had tubes and took forever to warm up. I remember seeing A Hard Day's Night at the Air Force base cinema. At the end of the film, when the helicopter took The Beatles away, I remember that I cried because the film was not continuing. I thought Help! a year later also was an amazing film. The Beatles were brilliant. They were all very musical and pretty radical, really. 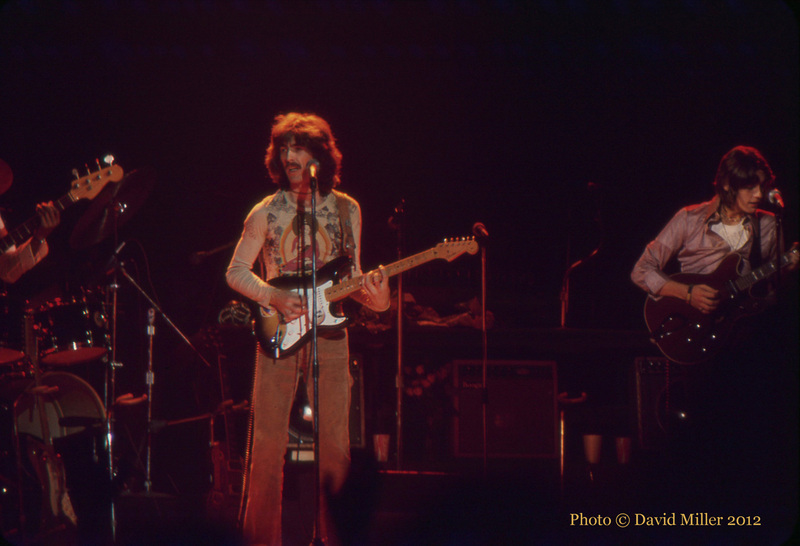 George Harrison was reserved and quiet, and I admired him greatly. George's songs with The Beatles were fewer, but just as wonderful. 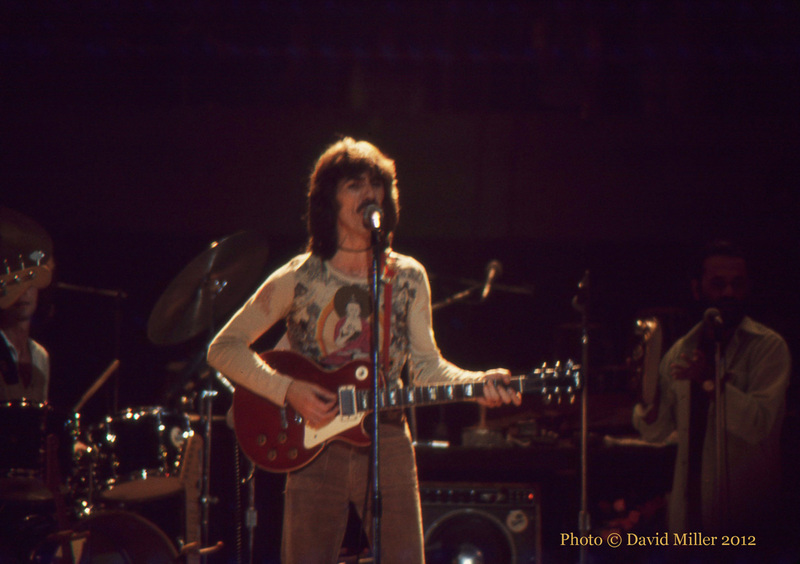 He did some Beatle songs at the Oakland Coliseum Arena, but not any of the early ones. 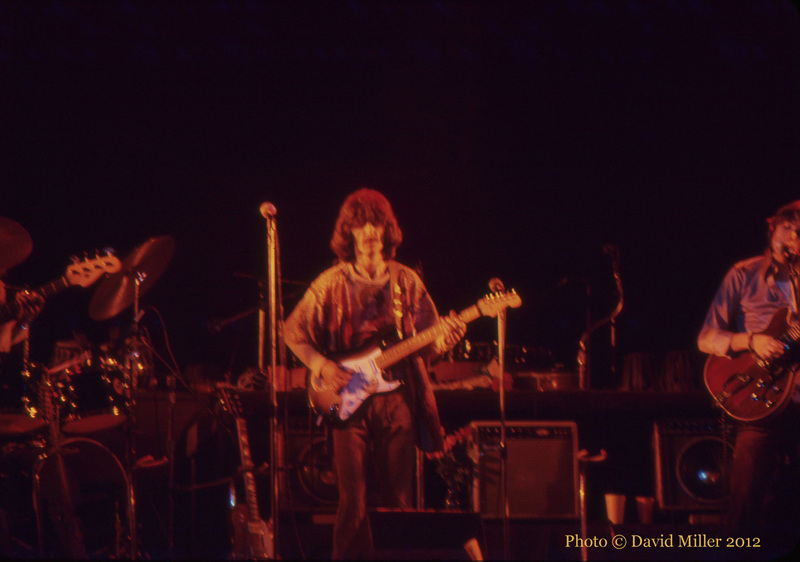 I remember him doing "Something," and, of course, "While My Guitar Gently Weeps." 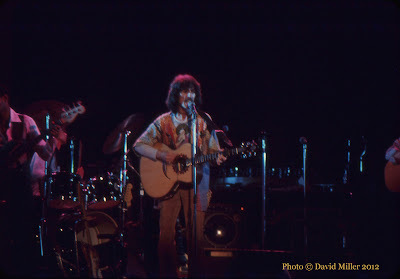 He also did songs from his masterpiece, All Things Must Pass, which stunned me when it came out in 1970. The breadth of music and thoughts on that album, and the attention to detail, was simply amazing. 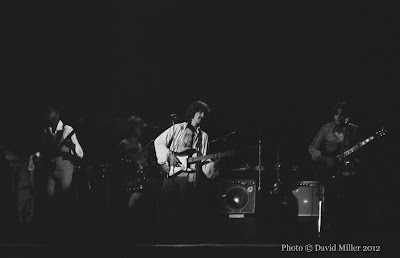 It seemed like the Oakland concerts were a smaller version of the Concert for Bangladesh, which was an epic event, but without the huge stars (Ringo Starr, Bob Dylan, Eric Clapton, Leon Russell). 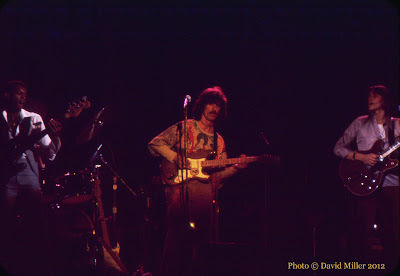 Instead, there were musicians like Willie Weeks, Andy Newmark, and Jim Horn. Billy Preston played keyboards and had a solo spot. 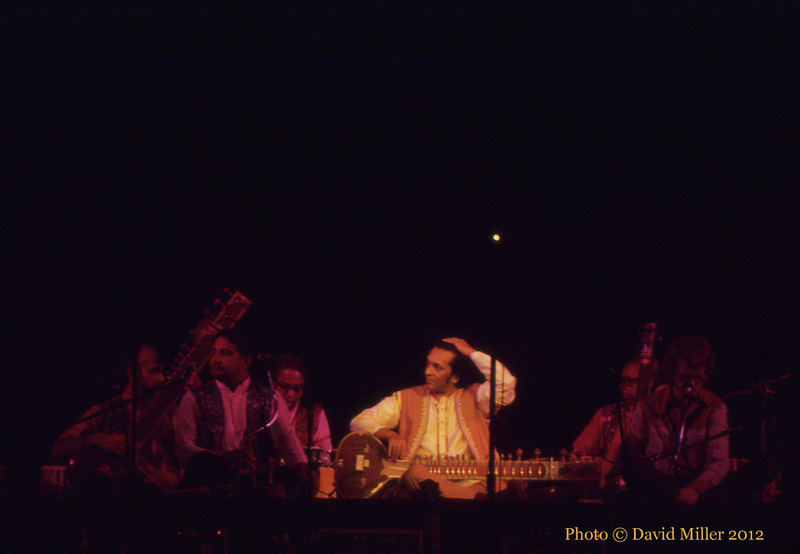 Ravi Shankar also played at these concerts, with beautiful classical music from another part of the world. His technique, and his dedication to the spiritual aspects of performing that music, were clearly in evidence. It was a large ensemble, and I liked what they did. At the end of one of the concerts, during the encore, we all left our seats and got into the stage rush. Things were pretty hectic, and the aisles were full of other fans. I remember being separated from Michael and David, and eventually seeing David up closer than I was, standing on one of the vacated chairs to get a better photo. I tried standing on one of the chairs, too, but soon gave up my perch when I started thinking that I might get in trouble with the ushers (who probably were just fighting for their own survival as things started to unravel). I don't remember where Michael ended up. 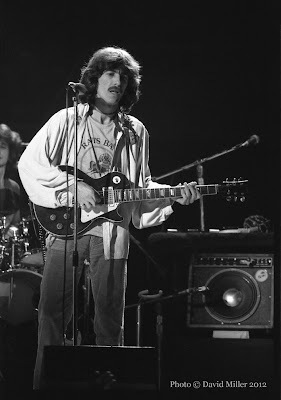 George Harrison was an underrated guitarist, and he was profoundly musical. Just listen to his slide work and electric guitar harmonies, as well as how he phrased solo guitar lines around the music of The Beatles. He was very intelligent, a committed artist and a world citizen. He is, and will continue to be, sorely missed. 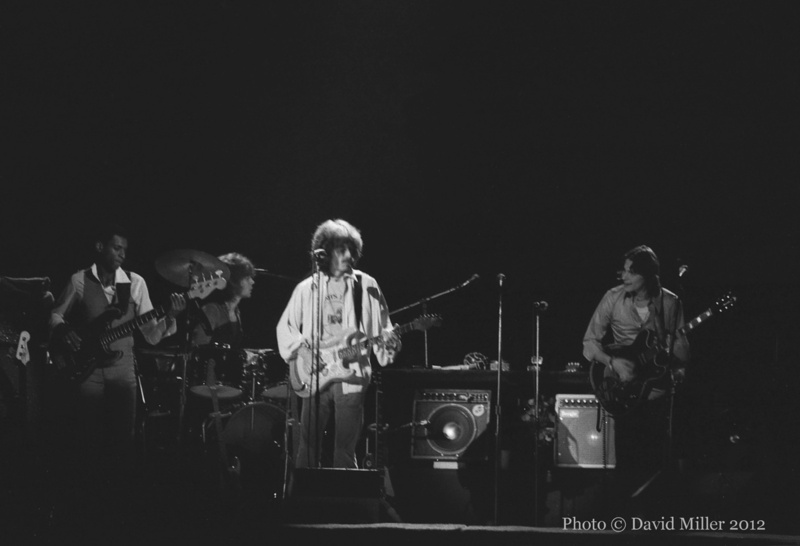 Michael: To say that I was excited at the prospect of seeing George Harrison at the Oakland Coliseum Arena does not even begin to describe what I was feeling. 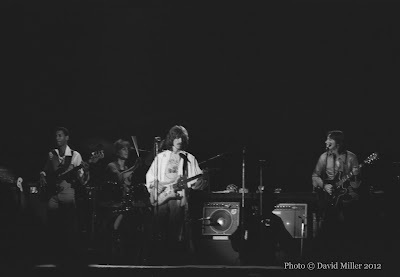 My friends and I attended many performances in those days, and I enjoyed all of them, but none of them could compare with the momentous thrill of seeing George Harrison. My own life had started in an English town that was near Liverpool, and I had been a full-fledged fan of The Beatles from the beginning. When I was thirteen, I had attended their last performance on August 29, 1966, at Candlestick Park. During my teen years in the late 1960s, The Beatles and their music had been at the center of my outlook. In 1974, The Beatles were no longer together, but George Harrison had succeeded in becoming a major star on his own terms. 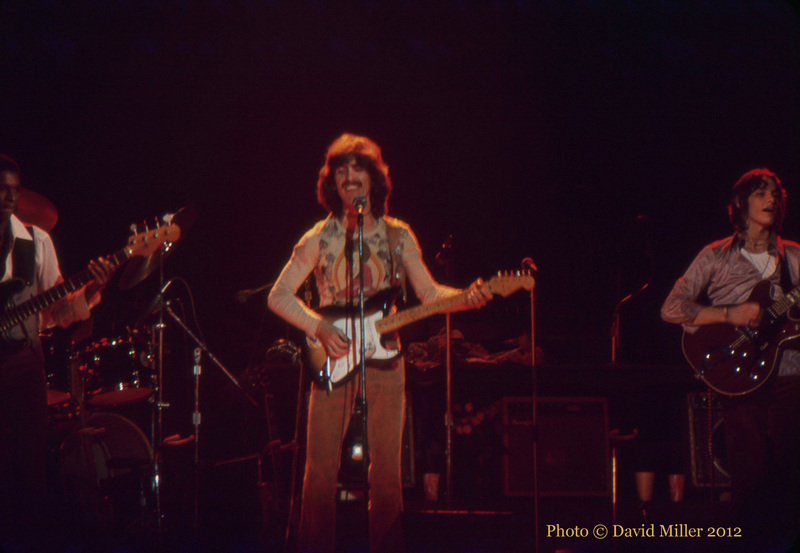 When it was announced that George Harrison would be going out on tour in the USA, I was quite surprised by the news. His lack of interest in appearing before the public was hardly a secret. For some reason, however, he now had changed his mind in regard to performing in front of an audience. David, Gary, and I got tickets for both of his shows in Oakland as soon as they were available. After all, it was a rare chance to see two performances by George Harrison, one of The Beatles, on the same evening! We wanted to see as much of him as we could afford to see. 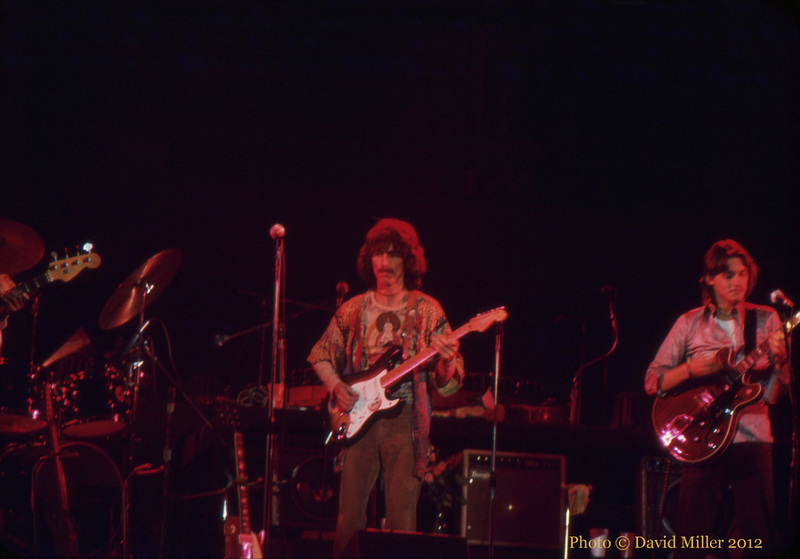 I was aware, before we went to the concerts, that George Harrison would be playing mostly his own music, which was fine with me. It had been ten years since the first days of Beatlemania, and many things had changed during those years. The Beatles themselves had gone through a nasty breakup. 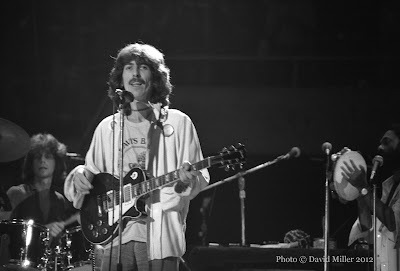 As much as I still loved The Beatles, and as much as I still loved the songs that George Harrison had recorded with The Beatles, I understood that 1974 was a different time. Besides, I also loved the music that he had been recording since the end of The Beatles. 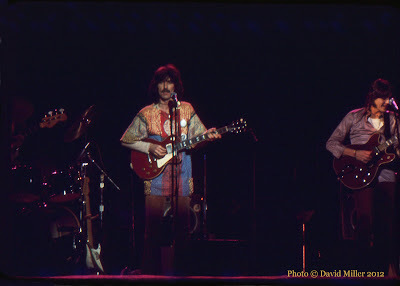 I figured that whatever sort of music George Harrison wanted to perform would be worthwhile. I had been seriously interested in Indian music since 1967, and I had seen Ravi Shankar perform once before, in 1968, so for me it was not a hardship to listen to the contemplative sound of his sitar, but I suspect that many others in the audience at the Oakland Coliseum Arena regarded it as little more than a nuisance. They probably wanted to hear only rock'n'roll. The Indian music was beautiful and compelling, but it did result in the overall flow of the concert being slowed down. Nevertheless, I was grateful for the opportunity to hear Ravi Shankar and the other Indian musicians, and I greatly enjoyed the wonderful music that they offered. 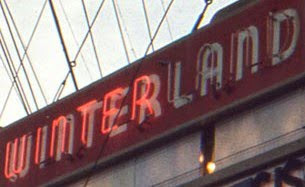 I do not remember there being much difference between the two shows that we saw in Oakland. (In between the shows we went out to the parking lot and sat in Gary's car.) 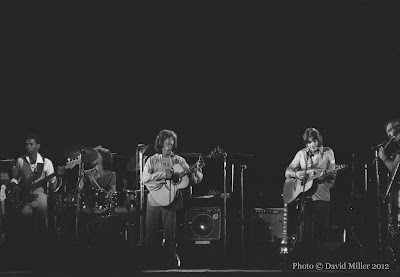 The concerts in the Bay Area were early in the tour, so the musicians probably did not want to take any chances with what they were doing. 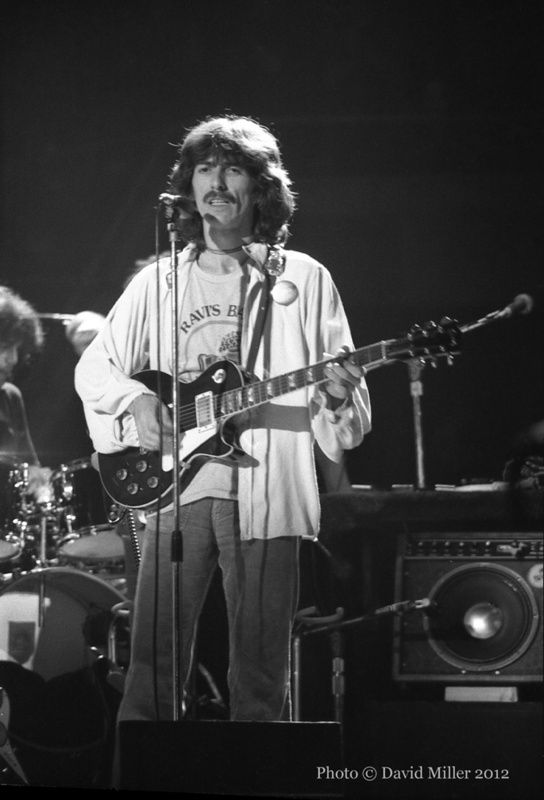 George Harrison's voice was noticeably ragged much of the time, and his awkwardness at being the main person in the spotlight could not be missed, so there was a certain degree of unevenness to both performances. 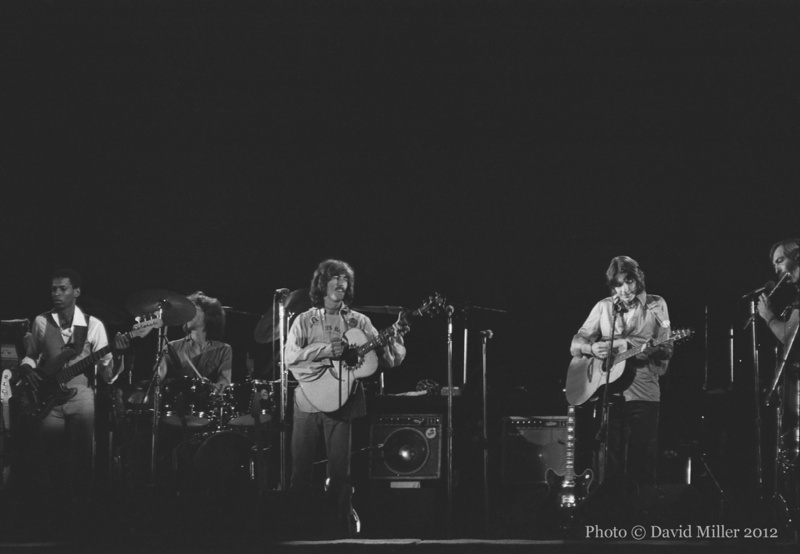 George appeared to be happiest when he could step back and play his guitar as part of the band. Also, the songs from his new album, Dark Horse, did not seem as strong as the songs from All Things Must Pass and Living in the Material World. Near the end of the second show, when George Harrison was performing "My Sweet Lord," many people left their seats and crowded together in front of the stage. It actually was a bit of a frenzy, resulting from fans getting carried away by the whole experience. My friends and I got up, too, and joined them. I carefully squeezed myself through the throng and moved as close to the stage as I could without being too pushy. I finally got near enough to get a close look at George, who appeared to be thoroughly caught up in the excitement himself. He was singing "Krishna, Krishna, Krishna," over and over. As I gazed up at him, I stood completely still, thinking to myself, "That's George Harrison up there!" I briefly felt as if I was in a trance. That particular moment is what I remember most clearly from the entire evening. I was there, and it was one of the best moments of my life to see George Harrison. I will always love him.